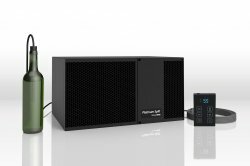 The Platinum Mini Split is small and compact yet powerful, and quiet. This compact sized wine cooling unit can cool rooms as small as 500 cubic feet and less. It is the perfect answer for a converted closet, pantry, and/or economical cellar. As with all of our Platinum Models, the Platinum Mini Split comes with our most advanced controller and gives the user complete control over their cellar environment. Please note it is strongly recommended that you get the exterior housing with the WSSMINI regardless of positioning. Without the housing, the inner fan is exposed. There is no additional delivery cost if the housing is ordered with the cooling unit. A delivery fee will apply if the housing is ordered on its own. The Mini Split system cools a properly constructed wine cellar up to 500 cubic feet. The compressor can be located in a remote location. Cellar Size 500 cu. ft.
Evaporator is installed in the wine cellar. 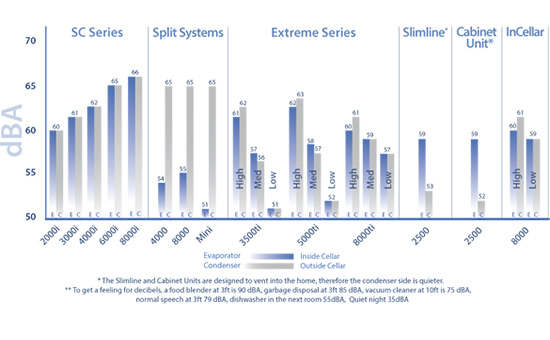 Condenser is installed up to 100 line ft. away - see installation specifications. Like all split systems, this mini split needs to be installed by an HVAC technician who will also supply own line set. The optional housing covers the exposed inner workings.